On the Bright Side, a Few More Nights of This and I Won’t Need a Halloween Costume to Look Scary. Those familiar with my Facebook status updates, will already know that Little Brother’s been under the weather. It’s uncanny, actually, because my kids have an unbelievable knack for getting sick on their birthday. You all probably have great pictures of your kids blowing out candles with their little eyes wide saucers of delight. Not me. Most of my birthday photos are rosy-cheeked fevered boys with glassy eyes and a runny nose. It’s horrible actually. Anyway, the birthday was Monday so, predictably, Little Brother started acting weird on Sunday afternoon. Me to Husband: He’s totally getting sick, I know it. Husband: Stop. He’s fine. You’re making too big a deal of it. Anyway. Long story short we had a day of runny nose and fever, followed by a birthday of lethargy and fever, followed by a day of all three, followed by a day of non-stop coughing. Notice I said “days of” those things. The first few nights, my job was to administer Tylenol and Motrin to keep the fever down. Often, Little Brother would wake crying and I’d rush into his room, medicine in hand, to soothe and comfort until he fell asleep again. Which meant a half hour or so of lost sleep three or four times a night. But, at least we were accomplishing something. But, as is always the case with my kids, they’re sort of into the medicine idea for the first few days. By the third night they’re totally cranky little bastards who are completely pissed off that they’re sick. So last night, Little Brother’s fever had broken but he was coughing up a storm in his bed. His sleep was restless and, knowing his last dose of cough syrup was more than four hours ago, I decided to head into his room with a new dose. 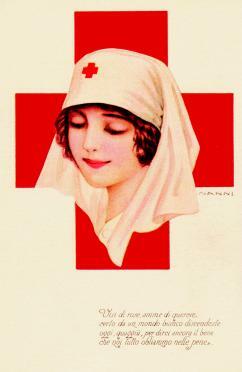 I picture myself a little Florence Nightingale. Little Brother? Who was actually finally asleep when I came in and woke him up for medicine? He thought I was more like Annie Wilkes. Somehow I forgot the old “never wake a sleeping baby” mantra. It didn’t turn out well for either of us. It was a loooooong night. She was scary as hell, wasn’t she?